As the community starts to grow it would be great to know who people are and what brings them to Cantata in the first place. So, a thread of introductions! Just say a little about yourself and what makes you interested in Cantata/what you’re looking forward to. And! If you’ve got a favorite strategy game, let us know! I’m Kyle, the lead developer/creative director of Cantata! I’m obviously excited about everything in the game as one of the people making it, but what makes me most excited is seeing how people use the systems of the game to make it their own. I’ve got big modding plans for the game that I’m not quite ready to talk about yet, but I really think the community is going to be able to take this game to some crazy places. Ad for favorite strategy game, that’s hard to say. 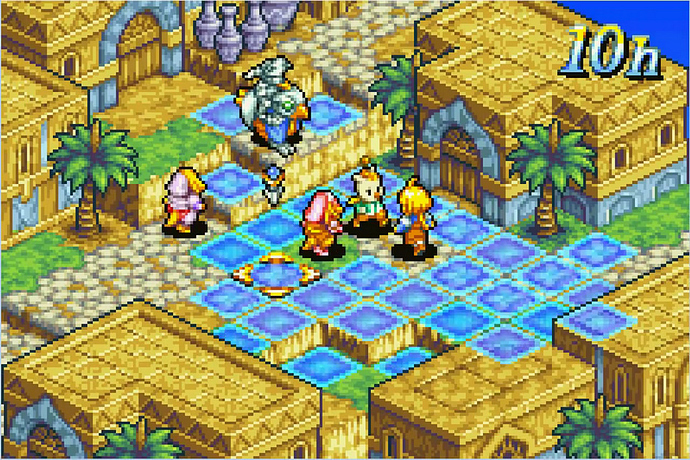 Advance Wars is clearly a winner here, but in terms of a game that has stuck with me long after I’ve played it I’d have to say Final Fantasy Tactics Advance. Hey all, Craig here! I’m doing the sound design for Cantata. I live in NYC and my main hobby is eating burgers at Five Guys with Kyle. I’m a big fan of Into the Breach so I’m pumped to be working on this turn-based strategy game! Hi, my name is Jacob, and I heard about Cantata on Reddit. I am about to finish my programming degree and would love to help out in whatever way I can, be it testing or coding. I really want to get into game design, and as a fan of Advance Wars and FF Tactics Advance, I am really excited for this project. My favorite strategy game is Advance Wars, but I was always a little disappointed by the unit and CO balance. My brother and I always had to ban CO’s on maps because who wants to fight Javier with 2+ COM towers, or Hachi under any circumstances? Happy to have you @FlashFire! I think AW is clearly balanced for Campaign only really. Some things, like Eagle in AW1, have CO powers that are totally broken. Take another whole turn?! I think for Cantata the COs are a lot more present in a given match, so ideally tie into the battle more in ways that doesn’t mean their emphasis needs to be all on CO powers for that flavor to come through. I think that outsized burden is definitely what drove AW to places like that. But also, it was fun to totally stomp with Eagle! Hi, my name is vitaliy, im responsible for this game spritework. I grew up playing pc isometric games so there wiil be none of those boring sqares, only hip dynamic rombs. My favorite strategy game is Disciples 2, misunderstood and forgotten by unworthy. My name is Royal Teague. I’m a composer & songwriter based out of Atlanta. I’ve written music for a variety of short films, pc & mobile games, along with a catalogue of EPs and singles. Kyle and I met at a chili cook-off event. I’m Maren, and I’m working with Kyle on systems and game design as well as balance and nitty-gritty things like that. As you might expect, I have a history with tactics games, from more well-known ones like Advance Wars, FF:T and Fire Emblem to slightly more obscure titles like Langrisser and a game that I’m pretty sure was a bootleg that found its way to a local rec center that called itself “Pike and Shoot”. I’ve known Kyle for quite a few years now, and we’ve idly designed games on-and-off throughout that time, from concepts, to card games to board games, I’m excited to see where the team and the community take Cantata as it moves into alpha and progresses to release (and beyond)!